Another delicious vegetarian meal-- Mediterranean-style. 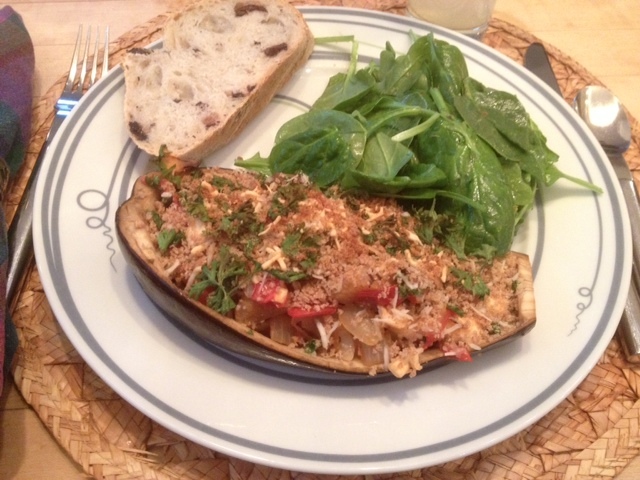 We tried a Greek-Style Stuffed Eggplant (250/cal) for one of our vegetarian meals this past week. It is not a difficult recipe to prepare but it does take a little extra time so should be on your weekly menu on a night you have time. Sunday suppers are great for us for these kinds of meals. It was filling and satisfying. To complete the meal I added a spinach salad with oregano dressing (40/cal) and a slice of store-bought artisan olive bread (117/cal) for a total calorie count of 407. It was a great meal and a definite repeat.